Freewheeling original neo- bop Jazz. Intense, interactive, serious, and humorous. 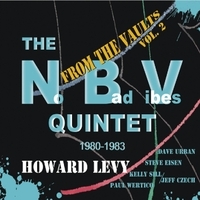 The best of the best of the 1980’s Chicago Jazz scene. Studio and Live recordings. “I started this band with trumpeter Dave Urban, bassist Curt Bley, and drummer Dave Derge in 1979. We were all part of the flourishing Chicago Jazz scene. NBV stands for “No Bad Vibes”. Either Curt or Dave Urban suggested that as the name, and it stuck. As time went by, I became the leader and added sax player Steve Eisen. Various drummers and bass players passed through the group, each bringing his own special touch to the sound. The band played regularly at The No Exit Café, The Piano Man, and other Chicago venues between 1980 and 1985. We mostly played my tunes, but also some standards, Wayne Shorter tunes, etc. I played piano 95% of the time in this band, as the primary focus of the band was the sound of the trumpet and tenor sax with rhythm section.